It’s not my responsibility to track Kanu, says Ikpeazu – Royal Times of Nigeria. 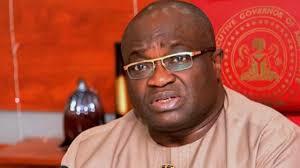 The Abia State Governor, Okezie Ikpeazu, said today that it was not his responsibility to track the leader of the proscribed Indigenous People of Biafra, Nnamdi Kanu, who is believed to be on the run. Ikpeazu said this in an interview with journalist shortly after a meeting he had with Vice-President Yemi Osinbajo at the Presidential Villa, Abuja. Although he described Kanu as his brother, the governor noted that the IPOB leader was not in the custody of the state government. “Those who are looking for him may have a better knowledge and have the capacity to determine the location of anyone in Nigeria. There are people who are trained to track people and it is their responsibility, not mine,” the governor said. Ikpeazu said government was trying to set up a committee for the MSME Council that is the Nigeria’s Micro, Small and Medium Enterprises and he was a critical stakeholder because his state is currently the SME hub of Nigeria. 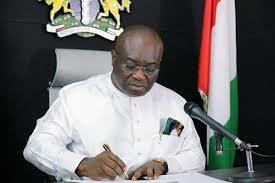 He noted that the patronage of Made-in-Nigeria products in Abia was growing. Part of the direct fallout of the campaign since the past 24 months he said, was that some parts of Ariaria Market where the shoe-making enterprise was flourishing had enjoyed steady power for three weeks now on a pilot scheme courtesy of the agency in charge of rural power supply. Beyond that, he said his government was interfacing and having better relationship with funding agencies and was able to attract about N1.3bn or N1.4 bn on direct sales from the Made-in-Aba shoes and dresses.